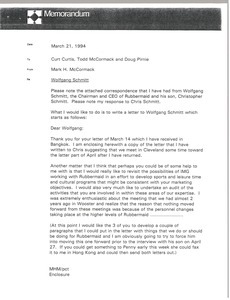 Concerning the attached memorandum from Barry Frank to Mark McCormack regarding IMG's volleyball involvement, dated October 8, 1985. 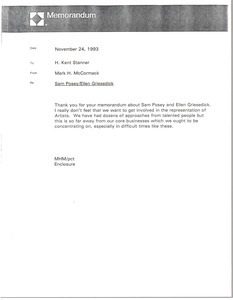 In response to Stanner's memorandum about Sam Posey and Ellen Griesedick, McCormack writes that he does not think IMG should get involved in the representation of artists, especially in difficult economic times such as these, when they ought to focus on their central business ventures. 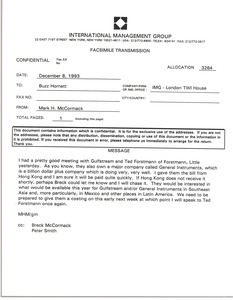 McCormack writes regarding a meeting with Gulstream, General Instruments, and Ted Forstmann of Forstmann, Little and Company. McCormack notes that General Instruments is a company that is doing very well, and that they have asked him what might be available for Gulfstream and/or General Instruments in Southeast Asia, Mexivo and Latin America. McCormack discusses communications and negotiations with Sybase, Inc. regarding a few different projects. 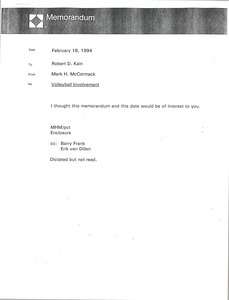 Attaches memorandum from Mark Reiter about Marshall Loeb. Reiter proposes idea to have Loeb interview CEOs for a recurring television show, including a list of potential CEOs. Attached Loeb article from August 8, 1994 Fortune magazine not digitized. 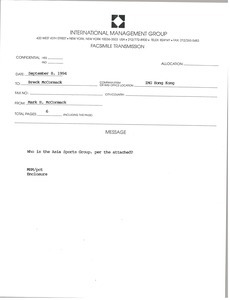 Concerning the attached documents, Mark McCormack asks who the Asia Sports Group is. Asks if Johnson has reaction to attached fax, in which John Battaglia of Home Run Derby Inc. discusses plans for a family-oriented baseball park. 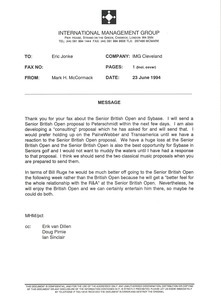 Requesting information on how much they received from Joseph and Feiss on the British open tournament license prior to the contract termination, how much they have received from Nutmeg, when the next Nutmeg payment is due, and how much it is for.